Oh sure, we all know how it goes: someone says, “We’re having a meeting,” and everyone within hearing distance scrambles for cover. Of course, it’s fun to make fun of meetings — but they’re not going away any time soon. And, come to think of it — effective meetings are an important tool for teams, no matter what industry you’re in. Meetings are key to launching new projects, bringing the team together and getting organized. And believe it or not, they can actually be productive and even (dare we say?) enjoyable. All with one itty bitty little detail: a proper agenda. Although meeting agendas are the unsung heroes of focused, productive meetings, they end up being treated a little like car keys: no one pays any attention to them until the last minute — when you’re walking out the door and realize you can’t go anywhere without them! Forbes contributor Tim Lipman suggests that you should spend twice as much time as you normally do on your agenda, making sure the meeting objectives are clearly defined. “If you’re not exactly sure what you’re trying to accomplish, you can be sure it won’t happen quickly,” he says. Do you want to make a decision on something — or just brainstorm options and hear feedback from attendees? Provide status updates, or troubleshoot problem areas? Proper amount of time is allotted for each agenda item — and the full meeting. You allow for ‘people time’. A few minutes at the beginning or end for people to talk amongst themselves, or make an off-agenda announcement. Plan. Your agenda is the ultimate project planning tool, and will help you think through your purpose, objective and goals. Share. Circulate your agenda to all participants in advance, in order to give them time to prepare appropriately. Run. If you are coming up with the agenda, then unless you designate someone else, you will most likely run the meeting. This means you need to stay in control of the tone and direction, as well as the outcomes. Be clear with any actions that need to be taken, as well as who is responsible for taking them. Make sure you, or someone you designate, is taking notes. Circulate. Someone needs to summarize and circulate those notes, especially if actions or accountabilities are involved. Follow-up. If there are agreed actions and responsibilities as a result of the meeting, follow-up with those individuals or groups. Not only do agendas need to be created in advance, they need to offer structure for attendees. Do not simply create a List of Topics and call your work done! Has a clearly-stated purpose for each agenda item.2. Is focused on driving action. The most successful companies make sure meeting attendees walk away with concise actions and tasks to perform. Has an end time. When people know they have a limited time to speak or get things done, they will more likely stay on topic and contribute meaningful dialogue. But don’t make it all by-the-book seriousness. Plug in some time for fun how’s-your-morning chatter, announcements and even some fun. If you’ve never used a meeting agenda template, you’re in for a happy surprise. They save you time and energy (always welcome), while at the same time making sure you’re fully prepared for a effective meetings. Successful meeting managers learn from experience, and — through trial and error — they develop their own formula of what works well with their team. Once they’ve nailed a successful meeting or two, they replicate that format for every meeting they manage. Voila – meeting templates! Looking for a leg up on a good meeting template? You’re in luck! 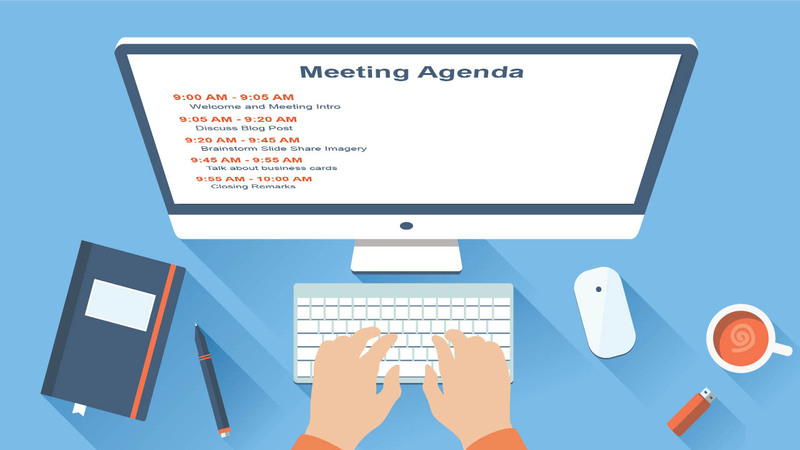 No matter what kind of meeting you have on the schedule, Redbooth has created templates for the most common and important meeting types. These templates will get you started quickly — and you can import them into Redbooth with just a click. If your template needs some adjustment, easily edit your templates and create custom templates just for you. 4. Transitioning from no agenda to agenda. Not every team has experience with a meeting agenda, and several members have a bad taste from previous meetings with failed attempts. Before transitioning to this new meeting format, participants need to be on board when kicking off the first few meetings. Educate them on why agenda meetings matter, how it will improve their days, and how adopting an agenda format takes time. Naysayers will try and pull the meeting ship back to port, but stay firm in your course to ensure meeting success. Preparation, structure and consistency are key to creative effective meeting agendas. And just think — with a few great meetings under your belt, your team members will start to anticipate well-run meetings — and even look forward to them. A virtuous cycle is born. Now that you have an agenda, need tips on running effective meetings? See here for more advice on running an effective meeting.